I get some data. I transform it to a Json text and publish it to a topic. - Where I am right now is that I have the json data and from my bp I call the pubsub op with the domain name, topic name and json. But if we stop here than the basics of pubsub is compromised. The pubsub model should send messages to all its subscribers. Does someone or Intersystems has any example or a BP made where pubsub messages is getting broadcasted to all its subscribers? - BP then sends to all targets from a call inside a loop of targets array. The target of which is set dynamically from context of the loop element. This gives me an extra functionality of putting some extra logic but most importantly in Visual Trace it doesn't look odd if target is a BP. If target is a BP and it is forwarded to, from a normal pubsubBo then in visual trace it shows a backward arrrow which is hard to explain to non tech people as it seems its going backward not forward. So forwarding it to targets from a BP is a better and cleaner option . Can share code to anyone if needed. I am working on a production (PubSubService Produciton) that I have exclusively created to manage Publish/Subscriber operations (not business operation). The purpose of my production is to receive the publisher's request, gets its subscriber based on topics and send them a message to perform some updates at subscriber level. I also want to receive an acknowledgement of updates from each subscriber. It would be very help to have your code that you have implemented to get a better architectural understanding. please share code if possible. So this is how the flow works . Note : This can be moulded as per the requirement. Each json msg can have a topic instead of the topic being outside of array etc. You can use your own messages instead of json too if you need. Hi Neerav, Have you get a chance to check my email that I sent you a couple of weeks. 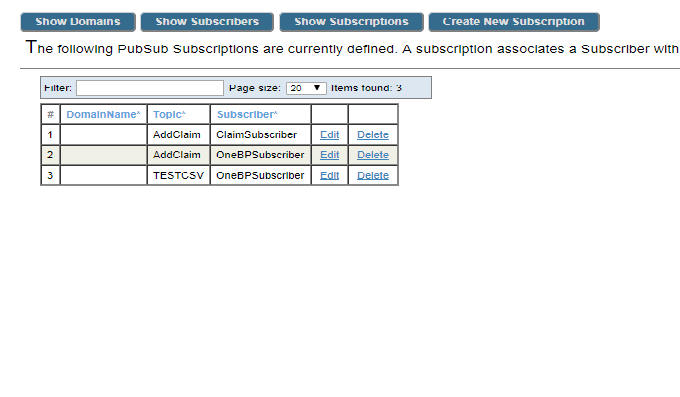 The Pub/Sub operation only gives you a list of subscribers, you decide what to do with that. I have a sample of Pub/Sub service/operation, I'll publish it in a few hours. Is there any service which continously polls for new additions to this log besides the Sql inbound adapter? You should use Ensemble Alerts for that.